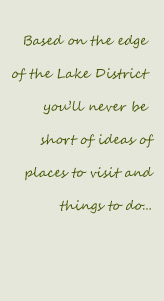 Summer Hill is well located to explore and enjoy all that the Lake District has to offer. The town of Coniston, only 9 miles north, lies on the scenic route to the Langdales and the central attractions such as Grasmere and Derwent Water. Bowness and Windermere are within 20 minutes drive. Beside enjoying our own garden you can visit other better known and splendid gardens at the likes of Muncaster Castle, Levens Hall, Sizergh Castle and Holker Hall. For literary connections you can visit Brantwood, with fine views across Coniston Water or Wordsworth's Dove Cottage at Grasmere. The varied industrial history of the area can be appreciated from visits to the Dock Museum at Barrow and the Stott Park Bobbin Mill. Other attractions include the steam railways at Ravenglass and Haverthwaite. The South Lakes Wild Life Park, Muncaster Owl Centre and Lakes Aquarium at Windermere are just a few of the many family attractions close by. We have detailed information packs in all the accommodation.